In June 1981, six children witnessed the apparition of the Virgin Mary on the Podbrdo Hill, in the parish of Medjugorje in western Herzegovina. Ivan Dragicevic was one of these children; he was 16 years old then. Years after coming to terms with the holy role that has unwittingly evolved for him, Ivan has been traveling to the four corners of the world to share his experience and spread the messages from the Virgin Mary. In February 2008, he was in Australia for the fifth time. Two days before his prayer and talk night at The Sacred Heart Parish Church in Pymble, a northern Sydney suburb in Australia, I came upon the information about his visit. Looking back, it was divine providence that I found myself looking through the Croatian World Calendar website to find this information. That was how on 26 February, my mother and I got to be among more than 600 people to hear Ivan share his holy encounter with the Gospa, the Mother of God. At 6.40 p.m. on that day, there was complete silence and stillness in the church as this was the time every day that Ivan prayed and spoke with the Virgin Mary. It is difficult to explain; although I did not see her, I felt her presence. I imagine this was also true for most, if not all, who were gathered to pray with Ivan. 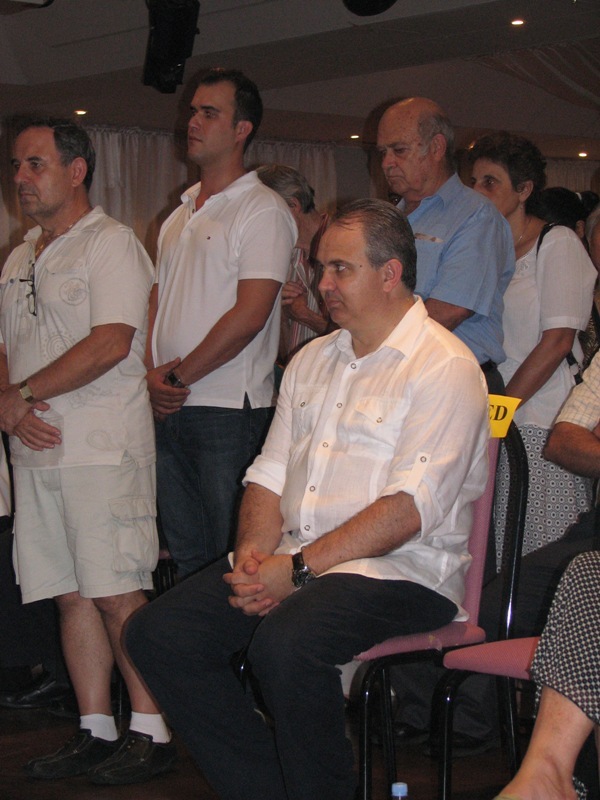 In February 2009, I had the chance to visit Medjugorje. The holiness of the place touched me. However, somehow, I wished Ivan was there to show me where exactly he was standing on the hill when they saw the apparition, to point which direction the image of Mother Mary emerged and disappeared from, to describe the fragrance in the breeze and the warmth or coldness enveloping him and the other five children. Even before I heard Ivan spoke about witnessing the apparition, I often prayed to the Lady of Medjugorje. 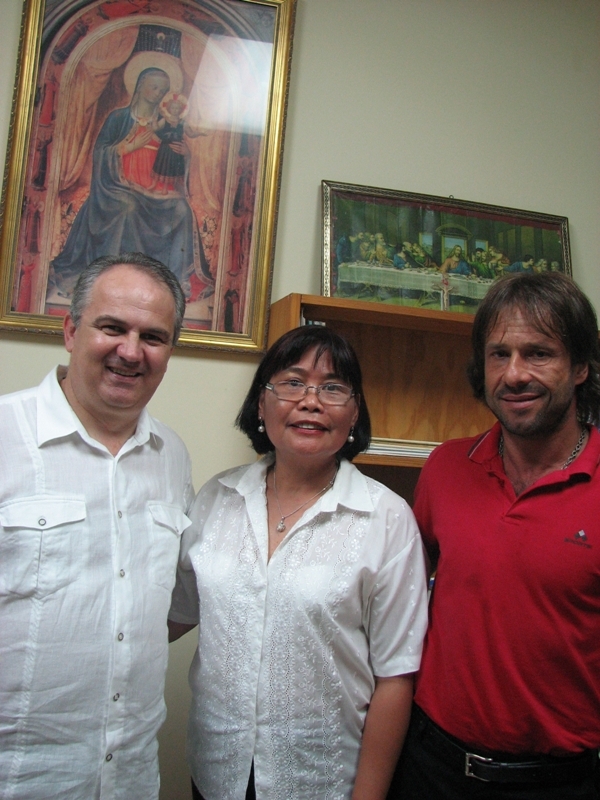 This connection with her became stronger after hearing Ivan spoke about her appearance and my visit to Medjugorje. Out of the blue, [on divine providence] on February 14, I received a phone call from Carolyn Scanlon who expressed great joy in finding my contact detail to tell me that “Ivan Dragicevic is back in Australia”. Although Carolyn lost her biggest help when her husband Max passed away in 2007, she has continued with coordinating Ivan’s visit to various parishes in Australia. After I met Carolyn in 2008, we did not have further communication but obviously we have remained ‘connected’ because of our belief in our Lady of Medjugorje. So three years later, on 20 February 2011, my 92-year old mother and I had another opportunity to meet with Ivan and again listened to him tell another congregation about the apparition of the blessed Mother Mary at the hill of Podbrdo in 1981. 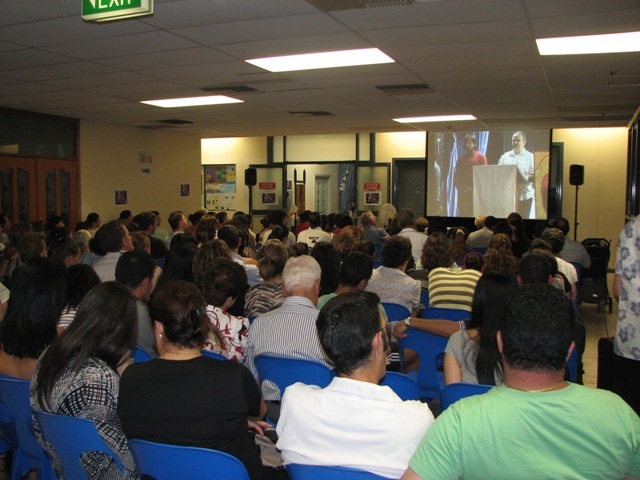 This special event was held at St Johns Melkite Greek Catholic Church in Greenacre [south western suburb in Sydney, Australia]. My mother and I met briefly with Carolyn and Ivan upon arrival at St John’s Church. I thought that Ivan has not changed much since the three years I saw him. The rosary was prayed at 6 p.m., followed by Ivan’s daily prayer ‘meeting’ with the Virgin Mary at 6.40 p.m. In much the same as in 2008, there was complete silence and stillness during this time. Ivan was kneeling in front of the altar and was looking up as he prayed. Then he seemed to be in conversation with someone – nodding his head, saying something and at times was smiling. Ivan’s prayer time to the Virgin March was followed by the mass celebrated by His Grace, the Most Reverend Issam John Darwish with the assistance of a number of priests. With the exception of two things, I found the mass and the hymns to be overall the same as the Roman Catholic mass. The minor ‘variations’ included the congregation being reminded by one of the assistant priests who sang “Let us all be attentive” just before the gospel was read and other parts of the mass. Also, during communion small slices of bread was dipped in the wine and placed in the people’s mouth. By the time the mass was finished, it was well past 8 o’clock in the evening but nobody showed any sign of leaving. Everybody waited with great anticipation to hear Ivan speak about the apparition. Ivan spoke in Croatian with his talk being translated in English by Robert Matek as he went along. It was the same story and told the same way as in 2008 and I even recalled some of the lines. And yet, I was transfixed listening to each word right to the end. As can be expected, there were many people wanting to see and speak with Ivan after his talk. Mother and I waited for about ten minutes, and were so happy to be called in an office to have a brief interview of Ivan. I managed to ask only a few questions. My questions and Ivan’s responses were also translated in by Robert Matek. VC: The last time we listened to your talk was in 2008, are there new messages from the Lady of Medjugorje for the Australian people? ID: Our Lady never talks about specific people or country in the world. She sends messages for the whole world. Our Lady is very concerned about the materialism that has taken over the world. These days the world is affected by serious emptiness. There is a need for all nations to cultivate a culture of the heart. VC: Since the apparition at the Podbrdo Hill, have you seen the Virgin Mother again? ID: Our Lady appears and speaks to three of us [Mirjana Dragićević, Vicka Ivanković, and myself] everyday. Although we speak to her in Croatian, she speaks in Aramaic. She gives us blessing to continue to request her children to conversion, prayer, confession, reading the bible and fasting. When I speak with her as I did today, others may not see her. But I say, blessed are those who don’t see but believe. VC: What is your advice for people to get closer to Our Lady? ID: There is a void occurring where the family unit is under attack. We have to build the family; build the family structure. There is a definite need for spiritual renewal in us. This way, we get closer to Our Lady. I was fortunate to have a photo with Ivan before he had to speak to others who had been waiting patiently for him. I am grateful for the blessing of having the opportunity to visit Medjugorje and to listen to Ivan twice now. I pray that there will other times. I just wish to share email from Carolyn Scanlon giving information on attendance at the various talks by Ivan. Hi Violi, About 1000 was estimated at Greenacre. John Canavan was the man who led the rosary. 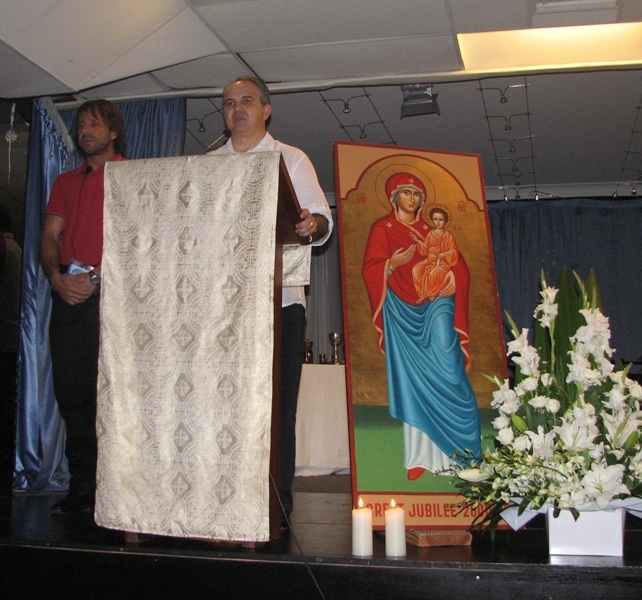 He is the director of The Divine Mercy Publications in Melbourne & who organised most of the venues at which Ivan spoke. The cathedral in Perth was packed , est about 1000 people, Adelaide est about 700-800. Dandenong est about 1500 and Waragul and Ararat, both small towns, est about 300 at each church. Ivan was very happy with his visit to Australia. Saw your article. It was great.